2017 appears to be a year for bold interior trends and geometric designs & accessories appear to be a way to make that statement. Geometrics are ideal as they evoke a timeless modern feel and make any room more elegant and let’s not forget eye-catching. Another quality of geometrics is its versatility as it can be used with various types of patterns and décor. 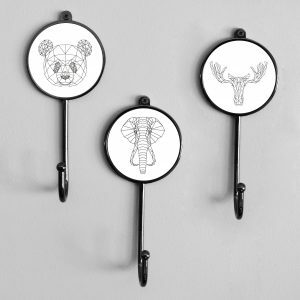 You can quickly change the feel, or mood to your interiors with our new decorative geometric animal hooks which are ultra-modern, urban, fun, and gender neutral. Why not amp up your living room, bedroom, kitchen, study or utility room with our geometric animal hooks that will inject style and are perfect for hanging your accessories or coats? Our hooks come in a choice of 30 designs and come complete with a screw and a hook base colour of gunmetal black or brass for an easy and instant transformation. Look out for these geometric animal prints coming soon on ceramic mugs, and on a gorgeous cushion pillow. We also have these available in cupboard door knobs. This entry was posted in Home Decor, Home Accessories and tagged geometric, cupboard knobs, home decor, geometric knobs, hooks, cupboard door knobs, geometric hooks on 17th February 2017 by admin.